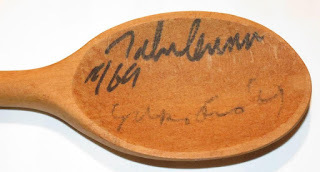 Liverpool Beatles Auction: A signed spoon. This wooden spoon was signed by John Lennon and Yoko Ono in 1969. It was part of an Event Package that was given out at Institute of Contemporary Arts on 10th September 1969, where there was a screening of some of the pair's avante garde films. The pack included various flyers and a tin tray/cake tin to bang the spoon on as a noise-maker during the screening of the Two Virgins film. The spoons were all pre-signed by John and Yoko before they were handed out. The 2013 Liverpool Beatles Auction takes place on Saturday 24th August. Items are being taken in for the sale at The Beatles Shop on Mathew Street, Liverpool. Click here for more details.